SCVHistory.com LW3439 | Rancho Camulos | Souvenir Postcard with Rare Camulos Postmark, 1908. 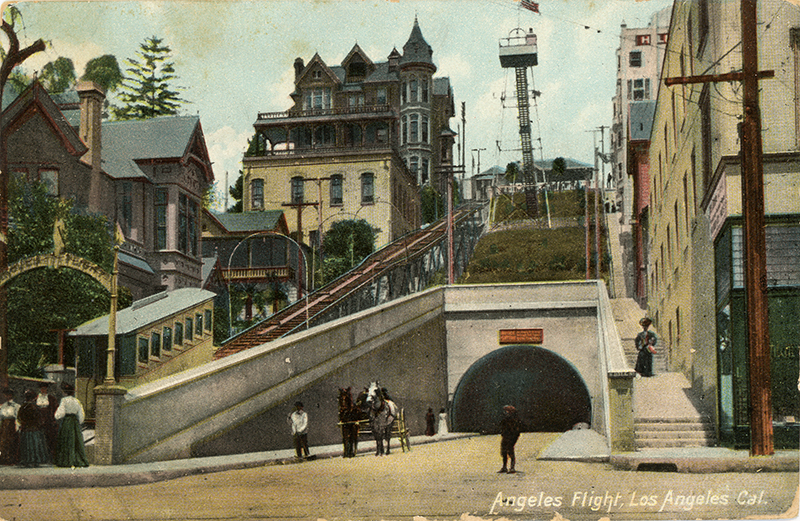 Nothing against Angels Flight (misspelled Angeles Flight; see below), but this time it's the back of the postcard that is of primary interest from an SCV history standpoint. It bears the rare Camulos postmark, dated June 9, 1908. Just who the postmaster was, and where the post office was located, will require some further research. It's unlikely the post office was located inside the depot, inasmuch as it predated the depot (which wasn't staffed, to our knowledge). The Southern Pacific's spur line from Saugus to Ventura, with a stop at Camulos, first ran in February 1887. According to Frickstad 1955 (pg. 218), the Camulos post office was established October 19, 1885 — not long after the initial publication of Jackson's book. Per Frickstad (ibid. ), the post office was officially named "Camulas" until the following June 1 when it was corrected to "Camulos." It remained in operation until April 15, 1914, when the mail service was consolidated and switched over to Piru. If postmaster compensation is an indicator, the Camulos post office wasn't very busy (see Patera 1994, pp. 118-119). Compensation was based on volume. Per Patera (pg. 3), "In the smaller offices, the postmaster was entitled to 100% of the postal revenues. When revenues exceeded $1,000 per year, postmasters were placed into salary categories that increased or decreased in proportion to the revenue of the post office." 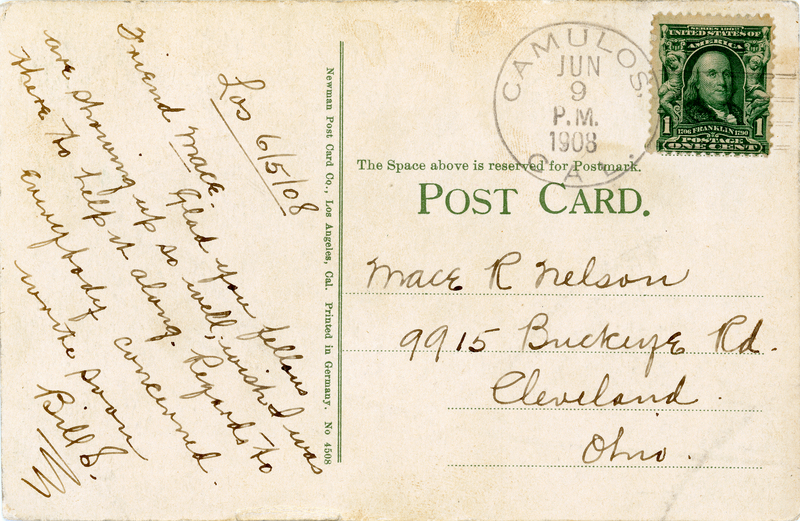 Our postcard is sent from "Bill S." to his friend Mace R. Nelson of 9915 Buckeye Road, Cleveland, Ohio. LW3439: 9600 dpi jpeg from original postcard purchased by Leon Worden.